I am often asked about how I go about writing a book. Today I finally finished HOME so it seems like an appropriate time to step back and dissect the various steps that have brought me here. There is nothing very mysterious about it. As any writer will tell you, the main thing is to start and then keep going. And how do you get to be a writer? By writing, mostly. HOME had been in my mind and a part of my conversations for a long time before I began to work on it seriously. 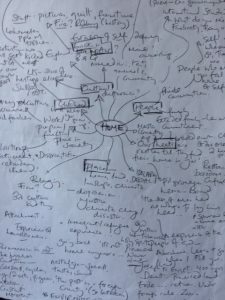 Once I decided to try and make it happen, the first thing I did was a spidergram – a big, messy splurge of all the ideas, themes, thoughts and threads that might possibly be relevant. Once I had that to work on, I asked myself what need the book would address – if in fact there was a need. 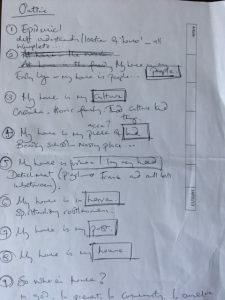 Did anyone other than me want to know where their home was? And I had a good long think about whether I had enough to say on the topic, or anything to offer. I didn’t want to write waffle for the sake of getting something published. The next step was to work on a coherent structure. I came up with a provisional chapter outline, and decided I would use my life story as the skeleton. It was my editor who encouraged me to have a more substantial biblical element, so that came later. When you write non-fiction, you only have to submit an outline and one or two chapters to potential publishers. So I wrote a chapter, rather randomly choosing to write chapter three first. 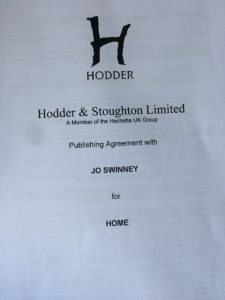 I’ve written about how I got a contract here. In April last year, I finally had a publisher, a word count and a deadline, which was the end of October. I know I can write roughly 500 words an hour, and I had 60,000 words to produce. I got out my diary, and identified writing slots. With my part-time job, freelance commitments, church, family, friends and the general demands of life to work around, it was a little challenging! In the end, I used every Saturday morning and two weeks of annual leave, along with every other available space. 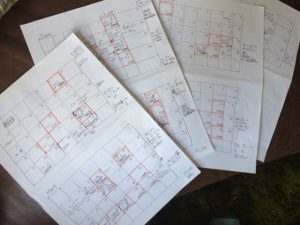 It was a question of sitting down with my laptop and pounding out the requisite number of words, whether I felt like it or not. This produced a fairly rough first draft, which I sent off to a team of first readers , seven people who were kind enough to give me their reactions and critique. Their suggestions got worked into the manuscript, and after that it went to my editor at Hodder. My editor was very thorough and there was a lot to work on after he’d gone through it, but I managed to turn it around in two weeks. My second draft met his approval – hurrah! But it wasn’t finished yet. 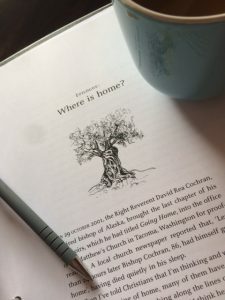 There was still all the copy editor’s queries and amends to go through, a final proof to read and check and a proof-reader’s finds to approve. There have been times in this last stretch when I have felt heartily sick of the whole thing, but also very exciting and encouraging things like getting to see the cover design, and reading the lovely endorsements. (p.s I did some drawings too). Nice! And good-day from us Nuts and Bolts! Sounds like a pretty efficient process, all in all! Firstly, huge congratulations on your achievement – I shall look forward to reading it! One question: you mention a ‘team of first readers’ – what kind of people are they? Did you get your MSS professionally edited, or was it more informal? That small glimpse of your art-work is tantalising – gifted you are!! My first readers are kind friends and family whose brains and way with words I respect and who give their time from love. Most writers I know ask people they know to have a first look at what they’ve done and wouldn’t expect to have to fork out for it. A traditional publisher will do a professional edit on your book and you won’t have to pay them for that. If you go the self-publishing route it is well worth the money to pay a freelance editor. Thanks for your encouragement re the pictures – feeling pretty nervous about them!